Much was made of the political wrangling, the failed procurement process or the amount of time it took for Ireland to finally get a postcode system. But what makes a good postcode? We will explore current implementations, previous recommendations, and privacy implications. Designing a new National postcode system is no small endeavour. 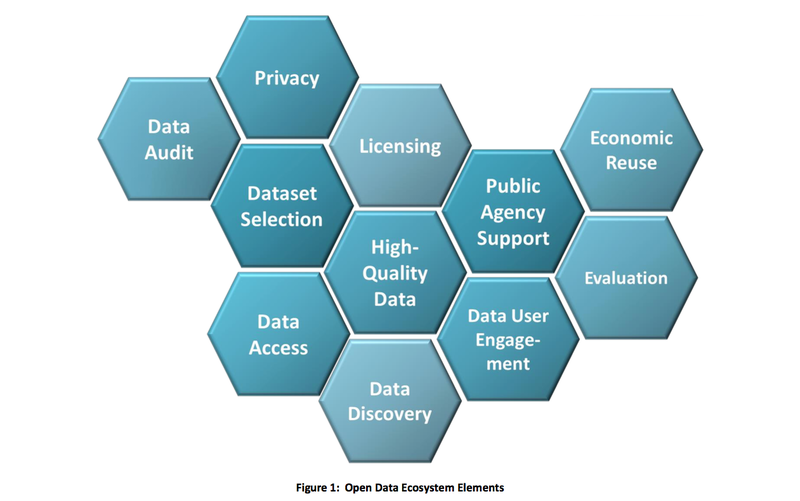 Data requires frameworks, and many aspects have to be considered. 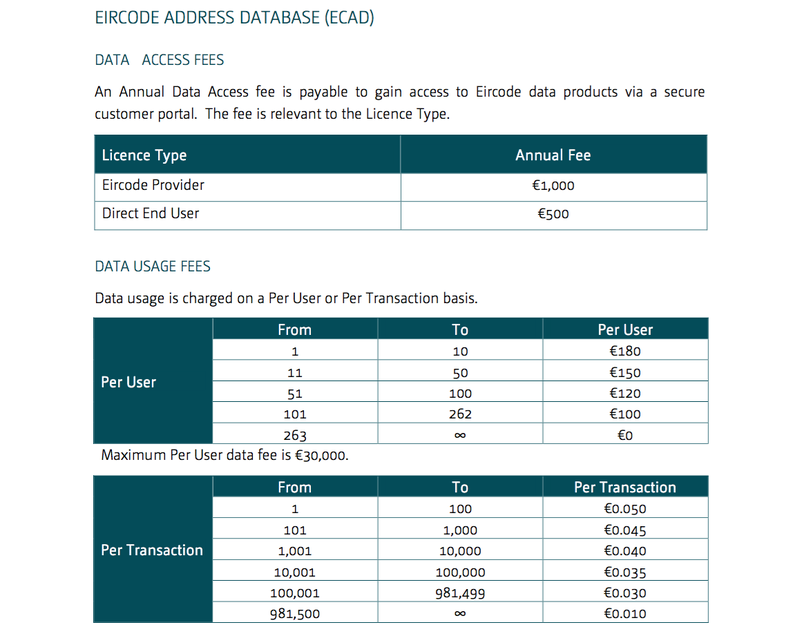 Eircode is a unique identifier in a non-sequential format. Non-sequential means there’s no relation between your code and your neighbour’s. Yours could be A65 F4E2 but nobody in your street or building will get an iteration of that unique identifier, such as F4E3 or F5E3. It will be completely random. This has many implications. As a user, it will be hard to remember or relate to another area within your neighbourhood. As a parcel delivery company or sorting office, it means you need to rely on a machine for each and every letter. You cannot possibly commit an area or sub-area to memory. It has further implications yet for emergency services, but more on that later. A checksum is a calculation built into the code to provide error checking. It is a check digit appended at the end, nothing you have to do or learn. Machines use it to differentiate L and 1 for example, or 5 and S. When you have millions of letters and parcels routing through your delivery system, and with human errors being made on labels, you might want this system in place. There are serious drawbacks from the uniqueness of its design. Each household will be assigned a unique identifier and there is no granularity. You either provide your exact location or none at all, since the code does not scale up or down. And this constitutes personal data. For the non-initiated, Eircode might look innocuous enough, but anonymisation does not simply entail removing names or other unique identifiers. Yet as soon as the system went live, Eircode’s lookup system on its website disclosed that information outright. Add to that that any lookup that you will perform online on a retailer’s website will disclose your exact address. Retailers and marketers can track you. And given the players involved, this should be very worrying indeed. Currently no Irish Address data is available as Open Data, i.e. freely available under an Open License. Opening Data has strong socio-economic benefits. Denmark, having a similar population to Ireland, made its official Address Data freely available in 2002, and quantified the benefits at €30m per year from 2015. The Freight Transport Association of Ireland estimates that the introduction of Eircode will cost €80m to its industry, even if just 5% of small and medium businesses adopt Eircode. 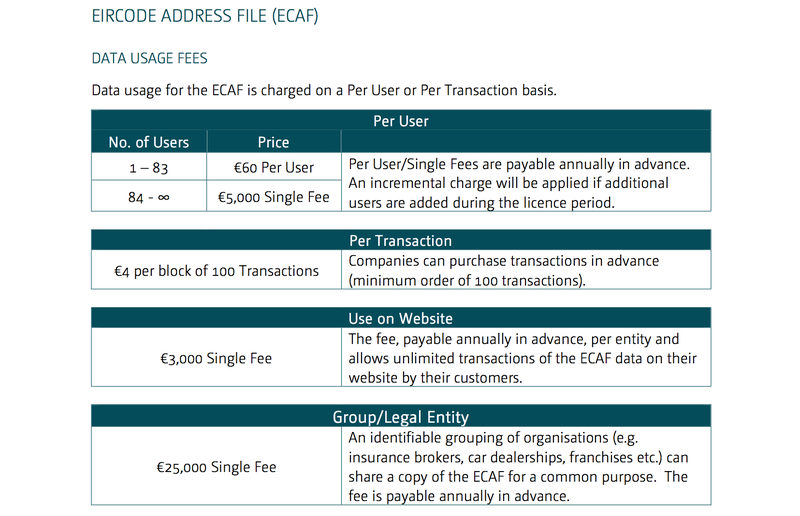 Its estimate is based on the assumption that any business that adopts the post code will need to pay up to 5,000 for an Eircode database on top of the cost of updating its own customer, accounts payable and accounts received databases to ensure it is compatible with the new system. This would put the cost associated with adoption at €1.6 billion at 100% integration. SMEs and businesses need to purchase access and usage, and update their own systems for existing customer information. The Freight association indicated none of its 200 members will use it. The Emergency Services’ representatives said it could cost lives. It fails citizen on data privacy issues. The only stakeholders set to benefit are the consortium’s members. So what’s in a postcode? In Eircode’s case: nothing. You could not design a system and make it worse. As for the Irish Government, the closest definition is systemic failure.